Marcus Garvey Park Alliance would like to host a weekly game night in the park for children and adults, from 6pm until sunset. We'd play Twister, quoits, hopscotch, Scrabble, backgammon, and more. With help from Street Corner Resources and support from Mount Morris Ascension Presbyterian Church, MGPA will set up, supervise/play, and then stow games, tables and equipment. We want to deepen and expand the neighborhood's cultural life by encouraging more people to enjoy the park in more ways on more days. Marcus Garvey Park has for over 40 years been the home of a Saturday Drummer's Circle; it offers extended weekends chock full of performances in the Richard Rogers Amphitheater, and baseball and basketball leagues. 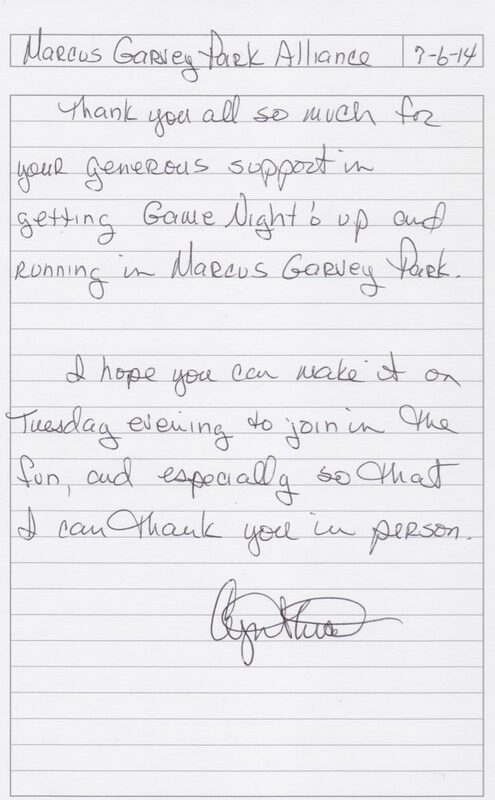 We hope that Game Night will give folks something fun to do in the park on a Tuesday or Wednesday. And, aside from being good, clean, fun, the increased presence of shiny, happy people in the park will help to improve its safety. We are in the process of determining which day of the week will be best, and designing a banner/logo. We will advertise the event via e-maill blast to the Alliance's mailing list, Twitter feed and Facebook page, and word-of-mouth. We'll purchase games (list below is just a suggestion). We will map out the exact location(s) in the park for each game. We'll schedule our committee members to supervise one week a month, and schedule our volunteers. A populated, active park is a safe park. The more people we can get into the park, the more people will come into the park. We would like volunteers to help set up and break down tables, chairs, board games, field games, and Twister mats; draw hopscotch boards on pavement; distribute and collect jump ropes. Some volunteers would arrive at 5:30 to set up for 6:00pm start; others would stay 1/2 hour past sundown to store equipment. Can be the same people, can be different people, we'll take whatever help we can get.